There were summits early morning of 23 May, but it may not have been the best choice to push it. Teams turned back, some never left camp and those who made said it was difficult. Meteorologist Chris Tomer told me “full on Jet Stream on the summit”. He advised his member, Ricardo Pena, to stay at the South Col, which he did on 23 May. Meanwhile the family of a climber who died over the weekend are willing to put more lives at risk to get their loved one home. And the admired traverse is not what was advertised. Jet stream has hit the summit. Woke up to 100kph winds. I thought I was dreaming but my tent ceiling was nearly on my chest. Tent poles snapped and tent itself is shredded. I seriously thought I’d be blown off the mountain inside the remains. The door was on the ground and I was able to unzip it and slide my oxygen bottle out. Next I escaped myself with a mitt on a me hand and a glove liner on the other while some of my gear blew out into the sky. I tried to sit on my tent to keep whatever gear remained inside but was losing feeling in my fingers. I called for help and my friend Les saw me sprawled over the remains of my tent and threw me a rope. I was able to get into his tent along with Ian. Winds continued to get worse. After the sun came our expedition leader must have seen my tent which looked more like a prayer flag in the wind and checked on us. He was two feet in front of us but we couldn’t hear a word he was saying. He motioned for us to leave our tent and go to his. A short time later the second tent I was in was destroyed. I had left mine tent with my sleeping bag, harness, water, food, and backpack. Not sure if any of that is still there. There are some worrying news about Rasmus. 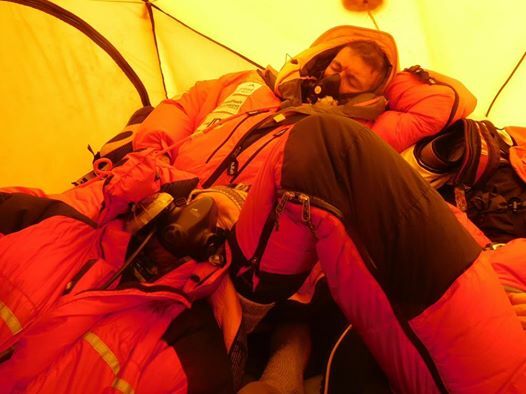 He arrived back at 7.700 last night after a long day out without oxygen. He says he had to abandon his attempt at 8.500m due to high winds. Today at the top of the world it was clear but very windy, we had to work hard for this summit. Feeling grateful our whole team of 20+ climbers, made the top. Other teams never risked going up in the winds. TODAY MORNING TIME NEPALESE JANUSZ CONQUERED MT. Everest from the north, and then he went down on the south side first and the fifteenth of the polish world traverse mountains. 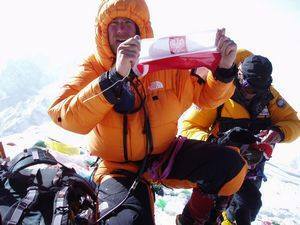 At the moment, JANUSZ IS ALREADY SAFE AT CAMP 3 Nepalskiej side. Tomorrow night will occur at the level of Janusz Takeover by Andrew CB Ziółkowskiego and attempt to get through to Kathmandu. [Update] Initially, we administered the Janusz climbing without the use of oxygen from the cylinder. This information proved to be false. So first, he used supplemental oxygen, 2) he hired a Sherpa to carry gear and 3) he, apparently, didn’t have a permit that allowed him to cross from China into Tibet over the summit of Mt. Everest. In summary his “No Oxygen Solo Everest 2017 – First Polish Traverse of Mount Everest Expedition.” was illegal, supported and used supplemental oxygen. Due to the time required for peaceful acclimatization, I need help carrying tents “booking” space in C1/C2. The rest of equipment + mountaieering activity and summit push solo. With Andrew we met yesterday and we are coming down slowly to lukli. With Kronikarskiego Duty I’ll clarify that the traverse I made alone with oxygen from camp 3 (8250 M), which was necessary to transfer the 20 pounds of gear needed to safely continue the action on the south side of the mountain. His Kathmandu agency told me he did not have a legal permit to cross into Nepal from China and was briefed in Kathmandu before receiving his permit to climb from Tibet. There was no mention of a traverse. It appears his plans changed for good reasons but I am a bit confused as to why the post on 21 May failed to mention all those details. But the big issue is the permit. I hope he can explain that We will see where this goes. The family of Indian climber Ravi Kumar, 27, wants his body retrieved “The bereaved family wants the body at any cost,” said Chowang Sherpa, managing director of Arun Treks and Expedition, the agency handling Kumar’s expedition. It was reported that Kumar had reached the summit with his guide at 1:28pm on Saturday and collapsed during the descent at 8pm due to low level of energy and oxygen. Another retrieval is underway costing $40,000 for an Indian climber, Gautam Ghosh, who died in 2016. His body was reported seen by Alex Txikon during his winter attempt in March at the South Col. In both of these cases, the Indian government is reportedly underwriting the costs. Tomorrow morning at 6am we will be heading up to Camp 3! Our team is excited. We feel strong, most of the crowds are gone, and we feel good about a good weather window coming up on the 27th-28th. Himex’s 3 members with guide Bruce Hasler and strong Shepra team is looking at the 26, but may slip a day. The season continues, and so does the wind. – even on the Tibet side. A word of caution, with the weather so wild and nearing the end of May, surprises are always in the cards. I think we will see a flurry of summits this weekend and then it will mostly be over. There are always a few stragglers but the monsoons look to be on time this year – early June – so this last window may be the last chance. I believe the elasticity of ice under pressure prevents the formation of crevasses much more than 50m in depth. I wonder is the body 200m from the main route in a small crevasse. In any case a 200 metre crevasse at that height on the mountain seems highly unlikely. Alan, how do the “rope fixers” climb when they are fixing the ropes at the start of the season? Do they use the ropes from the previous season or do they climb “alpine style”? Would the ropes and anchors survive from the previous season? I’m curious but does the climbing community not think it is a bit selfish to put the lives of 10-12+ men at risk to rescue a body? I have the greatest sympathy for the families of men who lost their lives, but risking and possibly killing more people will not alleviate their grief. Seems this is where Money over comes Humanity, sadly. Why should the Indian government spend tax payers money to retrieve the Indian’s body? I am a tax paying Indian citizen and India is a poor country. The government should not spend the tax payers money frivolously. Millions of Indians are starving and the government thinks nothing of spending 70000 USD to retrieve a body. Sheer waste of money and wrong priorities. And of course I really hope that the winds will calm, mental and physical resources will be reestablished and there will still be a chance to go to the top. 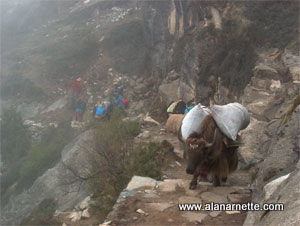 I hope people will make the choice to come down from the mountain as soon as it possible or many lives will be losted. GOD BLESS THEM! Alan: How is it possible to get a body from a deep cravasse without killing everyone? It sounds logistically impossible any place but at that altitude it seems not even worth the attempt. I hope the rescuers get paid upfront and get paid whether they are successful. Perhaps this request is coming from the government of India as they are covering the cost. That would be harder to ignore than a family plea for aid. Also I wanted to say that I have deep concern for George and his group trying to hold off the wind as well as for Rasmus alone and needing aid. One word: monsoonal rains that equates to tons of snow on Everest. I think out of close to now 8000 Everest summits, something like 4 have been in the summer. I’ll check and correct this but it is tiny.